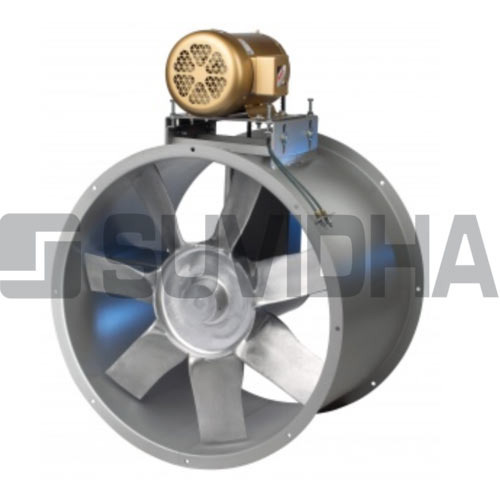 "Suvidha Air" Make V Belt Drive Axial Flow Fans. We have specifications like V Belt Drive arrangement. Impeller, which gives smooth functionality. Aluminum Axial Flow fan impeller dynamically balanced, 6,4,or 8 blade, V belt arrangement casing. These are rolled and flanged from heavy-gauge mild steel and hot-dip galvanized after manufacture. The standard casings enclose the impeller and motor completely and weatherproof external terminal boxes are standard. The motor is wired into the external terminal box through flexible terminal weatherproof conduit and a separate earthing screw is provided. Fume hood exhaust to exhaust dangerous fumes away from the operator. Welding fume exhaust in welding booths. Process cooling and exhaust of machinery and/or systems. Spot cooling of heat generating equipment such as generators or transformers.